For those Mac users who have been creating high quality Quicktime Movies for the internet, the leading software for the last three years has been Discreet's Cleaner 6 with the Sorenson Video 3 Pro codec installed. It seems like we have been waiting ages for something better to come along. 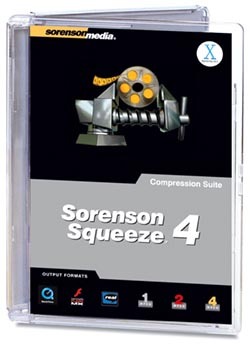 With the release of Sorenson Squeeze 4 Compression Suite, the wait may now be over. This review looks at Sorenson Squeeze 4 Compression Suite for Mac, which is the complete package. 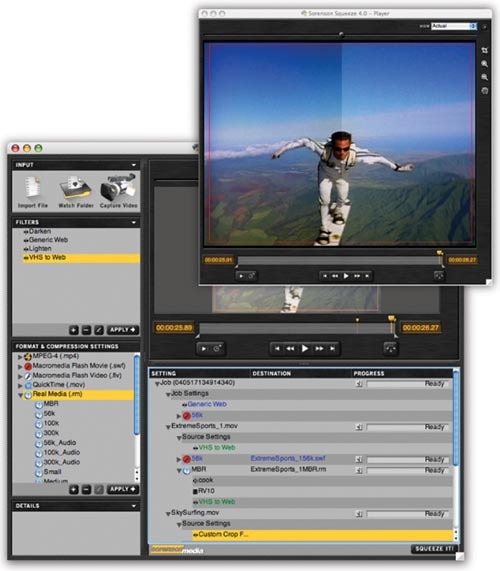 You can also purchase just Squeeze 4 for Flash MX, which contains the codecs to do Flash movies, or just Squeeze 4 for MPEG-4, which contains the codecs to do MPEG-4. The first thing you notice upon launching the program is the new interface. It looks really cool. And the preview window can be removed from the interface and placed anywhere on your desktop. This gives you more room in the Batch Window. The export options with Compression Suite for Mac include AAC, AIFF, DV, DVD, FLV 1.1, HD (for MP1, MP2, MP4, and Real Media), MOV, MP3, MPEG1, MPEG2, MPEG4AVC(H.264), RM, SVCD, SWF, VCD, and WAV. Unfortunately there is no Windows Media output option at this time. My company just finished work on a 16 mm film, which we edited in FCP HD. I thought I would take a DV Stream output from the project and see what Squeeze 4 Compression Suite could do with it. I also took the same DV Stream and ran it through Cleaner 6 to compare the results, and the results were exciting. Okay, I am a compression geek, but I found them exciting. Squeeze 4 created a smaller size file with better image quality than I could get with Cleaner 6, even when using the Sorenson Video 3 Pro codec within Cleaner. The other thing that was quite noticeable is the audio was better on the video compressed with Squeeze. From what I can tell, the reason the results are better is two fold. Squeeze 4 takes the original source material and gives you an output with an evenly divisible frame rate. In other words, you can set Squeeze to output one half or one third the frame rate of the source video. In Cleaner, you specify the actual frame rate, but not a fraction. The reason this is critical with 24P material is that the actual frame rate of this source is 23.98 fps. So in Cleaner, if you set the frame rate to 12 fps, you are not really outputting one half the rate of 23.98 fps. The result: motion that looks smooth and fluid in the Squeeze 4 output looks intermittently jerky in the Cleaner 6 output. The sound issue is a bit different. If you use software to sweeten the sound in your source video, this can cause some serious issues with compression. We used a program to remove a slight camera noise on this film. When compressing the sweetened source audio with the audio codecs available in Cleaner 6, the audio took a serious turn for the worse. One of the few Quicktime compatible audio compression codecs that does not cause this problem is MP3. Unfortunately this is not available with Cleaner 6 in OSX. You need to run Cleaner 6 on a Mac in OS9 (not Classic) to have the option of MP3 audio compression. MP3 is an option with Squeeze 4 in OSX, so we used that and were very pleased with the results. I then took a DV Stream that I use for various tests and compressed it with Cleaner 6 and Squeeze 4 Compression Suite, using the Medium Progressive Download presets that come with the software. The results were very similar, with neither software showing an advantage. The other area where Cleaner 6 always had an advantage is in adjustability. Squeeze 4 Compression Suite has closed that gap. 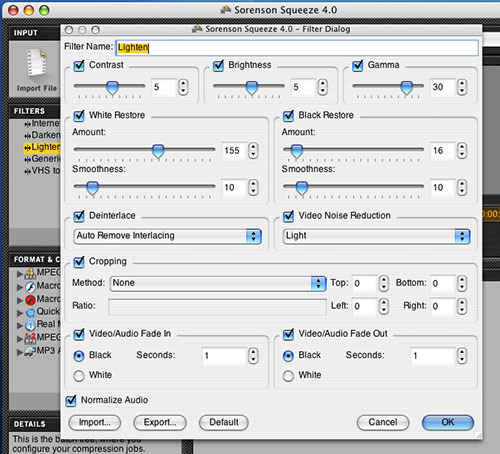 If you look at the two screen shots, you will see that Squeeze 4 now has many parameters that can be adjusted in the Compression Settings and in the Filters. This allows you to really control the quality, look and sound of your output video file. Squeeze 4 uses the latest Real 10 codecs in audio and video, where as Cleaner 6 is still using the older Real 8 and Real 9, and again Cleaner 6 must be run in OS9 (not Classic) to take advantage of these. To be completely fair, you can now download a Real Media Export Component (Real 10) to use with Cleaner 6, but it does not come with the current software package. Squeeze 4 Compression Suite does not allow Windows Media Video export like Cleaner 6 does (although Cleaner 6 exports the older WM7, not the current WM9). But Squeeze 4 makes up for this by exporting in the highly cross platform Flash codec. You can create very high quality Flash movies with the Sorenson Spark Pro codec that will play on any computer that has the Flash player installed. And I've saved the best for last. 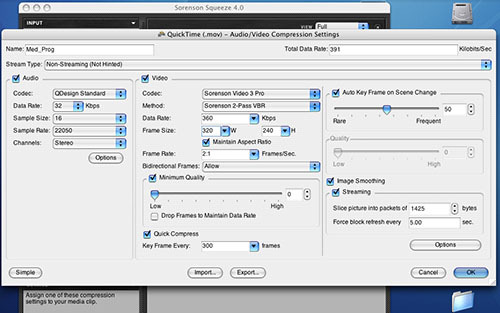 Squeeze 4 Compression Suite also includes the new Sorenson AVC Pro codec. Where as the older Sorenson MPEG-4 Pro codec (also included with Squeeze 4) produces very good MPEG-4 compression, the new AVC Pro codec delivers the new MPEG-4 AVC or H.264 video. This is the scalable high-end codec that Apple will be including with Tiger and QuickTime 7 to be introduced in 2005. When you take all this into account and a price of $499, the new Sorenson Squeeze 4 Compression Suite is a great value. To set up a comparable encoder with Cleaner, you would need to buy Cleaner 6 which is currently priced at $549 and Sorenson Video 3 Pro codec which is priced at $199, and you would still need to download the Real Media Export Component. Sorenson really did their homework on Squeeze 4, and it shows. Tim Carroll is a director, writer and video compressionist who runs Lil' Folks Productions LLC (an independent film company) in Chicago Illinois. He also moderates the Cleaner, Quicktime and other Compression Applications forum on 2-POP.com.